Did the apostle John write the book of Revelation? Q. Thank you very much for your recent post about whether the apostle John was the author of the gospel of John. This has been a question at the back of my mind for some time and it’s great to hear your reasons for believing John to be the author. I was also wondering about the authorship of the book of Revelation. In your study guide to Revelation you state that its author was unlikely to be the apostle John since in the Gospel of John and his letters he never refers to himself as John, but goes by “the elder” or “the one whom Jesus loved.” Along with that textual evidence, I was wondering what other evidence supports this view. Has the church traditionally seen the apostle John as the author, or is that a more recent phenomenon? “St. John Receiving His Revelation” from the Apocalypse of St. Sever (11th century). 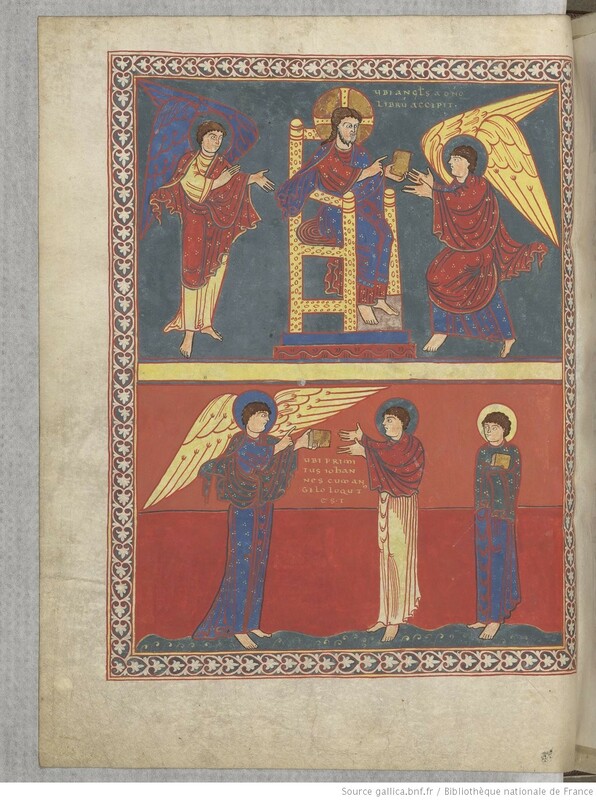 Church art customarily follows the traditional view in ascribing the book to the apostle John. We need to recognize that there was a tendency within the early church to accept that the books they read in worship and considered reliable had been written by the apostles or else by their close companions (such as Luke). This was in keeping with the growing belief within the community that these books were authoritative. And so we find early figures such as Ireneus, Tertullian, Origen, etc. ascribing the book of Revelation to the apostle John. So in the case of every New Testament book, when asking about authorship, we have to reckon with the tendency of the early church to ascribe accepted books to apostolic sources. And we need to be prepared to critique this tendency in light of evidence that is internal to the book (as Dionysius did in the case of the book of Revelation less than two hundred years after it was written). Rather, the perspectives are different. The gospel of John is said to have a “vertical eschatology.” That is, eschatological realities are understood to be present now, breaking in from the heavenly realm. For example, when Jesus tells Martha, “Your brother will rise again,” and she replies, “I know he will rise again in the resurrection at the last day,” Jesus counters, “I am the resurrection and the life” (now). For reasons like these I consider someone other than the apostle John, but a person who was nevertheless named John, to have been the author of Revelation. Thank you for this post it was very informative and interesting! Previous Previous post: Did the apostle John really write the gospel of John? Next Next post: Was Jesus the “angel of the Lord” who warned Joseph?